5/8 inch low stretch polyester double braid with wear indicator. 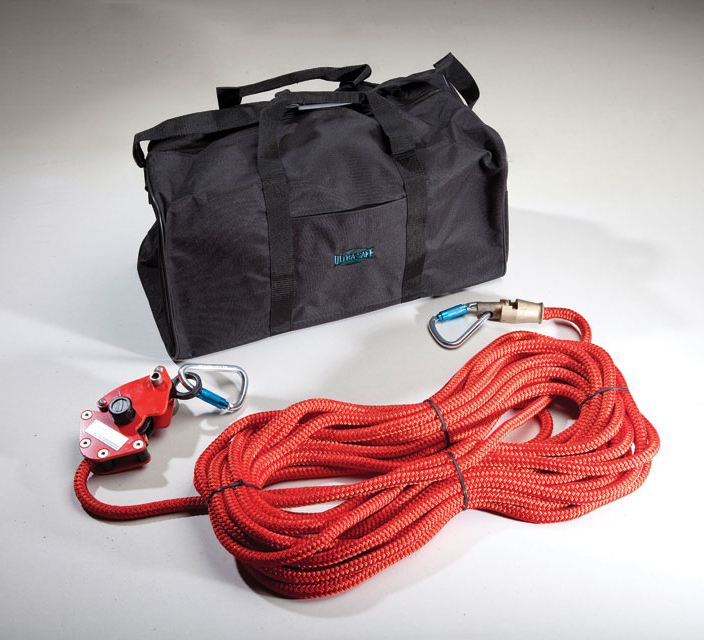 Up to 80 feet of 5/8 inch rope c/w a swivel socket to reduce rope twist. The RVT (Rope Vice Tensioner) is used to tension and lock system. System can be tightened by hand or additional tension may be applied with a 15/16 inch spanner, the pulley slips when MAX tension is achieved.The lightweight device is manufactured from high grade alloy and to keep moving parts free running, the pulley, cam and swivel socket are high tensile brass. All parts are powder coated for enhanced protection and visibility.For construction and other applications Ultra-Safe also offers its stanchion to provide multi-span protection. Simply run lines between stanchions and use a Y-type lanyard to remain attached at all times. Meets or exceeds OSHA & ANSI Standards.